This is one of the pivotal weeks of the year, tomato week. The whole focus is on getting ready to plant the big main crop of tomatoes and there are a lot of steps in the process. Tomatoes are a major part of our business and we pay special attention to making sure they very happy. Of course like everything on the farm we premeditatedly began this dance last summer when we took soil tests to make sure the tomatoes would have just the right amounts of mineral nutrients, especially lime and potassium which they need more of than any other crops. Then in September we work those minerals into the soil and raise up the beds we will plant the tomatoes into and seed a cover crop of clover and oats. This cover crop will hold the soil in place all winter, take up any extra nitrogen that may still be in the ground from previous crops and grow more organic matter to further enrich the soil for the coming tomatoes. A month ago we tilled the tops of those beds, turning that cover crop in so it could begin to decompose and release its good nutrients for the soon to be planted small tomato plants. Saturday I tilled those beds again, revealing a beautiful rich soil but we are far from ready to plant. Yesterday after patiently waiting for the incessant winds of Monday and Tuesday to stop we started early (hence the reason for a late newsletter) in calm conditions and pulled the huge 30′ by 100′ sheets of plastic over the Big Tops, under which the tomatoes will grow. New crew this year as the only people who have ever helped us do this job in the previous three years were Rett and Joann, it went flawlessly. 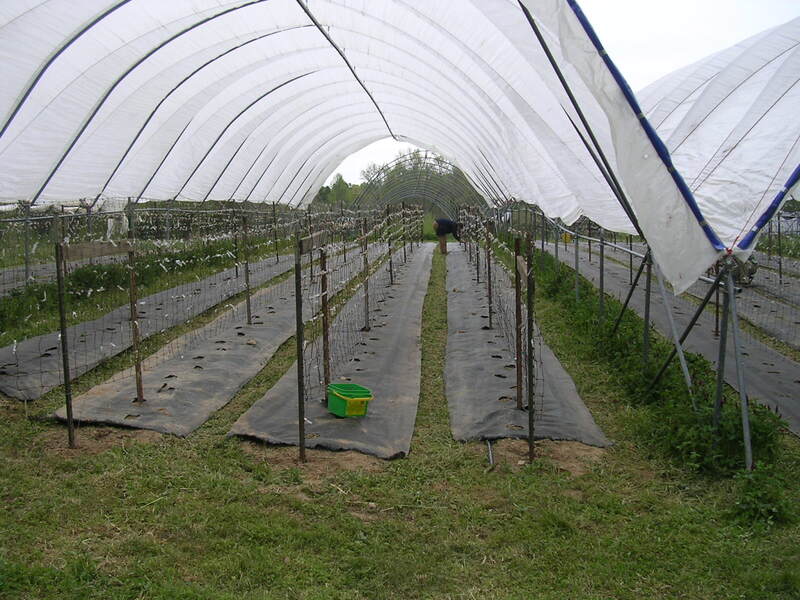 Under the shelter of the big plastic roofs, the beds can now be covered with the woven landscape fabric we use to keep the weeds down and warm the soil a bit. A drip irrigation line runs under the fabric because from here on we have to give the tomatoes all the water they will need. Finally 90 metal posts are driven into the ten beds of this planting and 1000′ of fencing that we use for trellis to support the plants will be hung from them. By the end of today all will be ready to plant. The hundreds of little seedlings are waiting in the cold frames, getting toughened up by the breezes and full sun. Monday they will all be tucked into that beautiful soil, ready to grow up those trellises and give us lots of tasty fruit! Saturday and Sunday is the Farm Tour, 1:00-5:00 each day. Our annual opening of the doors to the general public to come see the farm. Many of you have been on the Farm Tour before and it is a great opportunity to see many of the folks who sell and the Carrboro Market. Now in it’s twelfth year, thousands of people go on the tour and it raises thousands of dollars for the work Carolina Farm Stewardship Association does. Sponsored by Weaver Street Market, who does an incredible amount of work to promote the tour and local agriculture, it is easy to go on the tour. Just pick up a map at the Carrboro Farmers’ Market or Weaver St. Market or many other local businesses and go to first farm that you want to see. The best deal is to buy a button ($30) which will be your pass for as many people as you can stuff into one vehicle, for as many farms as you want. 34 farms this year so you will have to choose, it is hard to do more than 3 maybe 4 farms in a day. In the mean time we will be mowing and picking up around the place, nothing like have hundreds of house guests all at once to make you buff up the joint! Come on out and see what we have been up to, the weather looks to be perfect! Putting the final touches on the tomato trellis under the roof on a gray day.